Five of the Best Solar Panel Charging Options For Campers, Hikers, Boaters and All Types of Outdoor Enthusiasts. While we often head into the great outdoors to get away from technology and devices there are times when we need a cellphone, tablet or camera charged and ready. 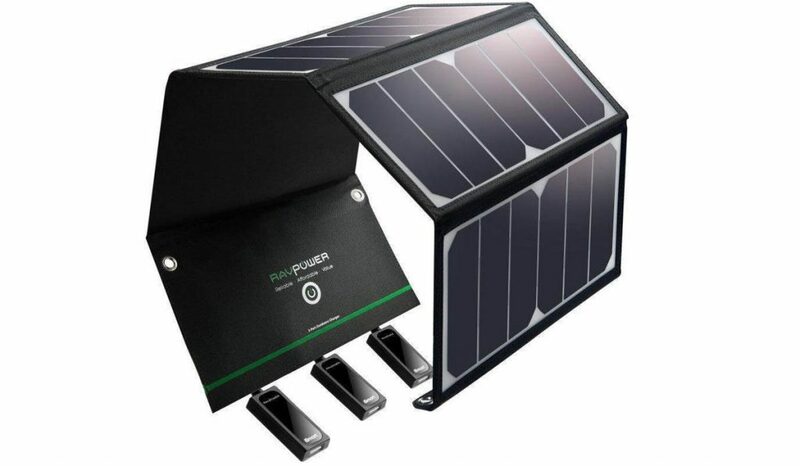 Nowadays there are various ways you can continue to enjoy these gadgets without bringing extra batteries thanks to solar technology that allows users to harness the power of the sun for charging. Solar panels allow backpackers and campers to spend more time outdoors without bringing heavy batteries with them. They are also a greener alternative compared to traditional batteries. 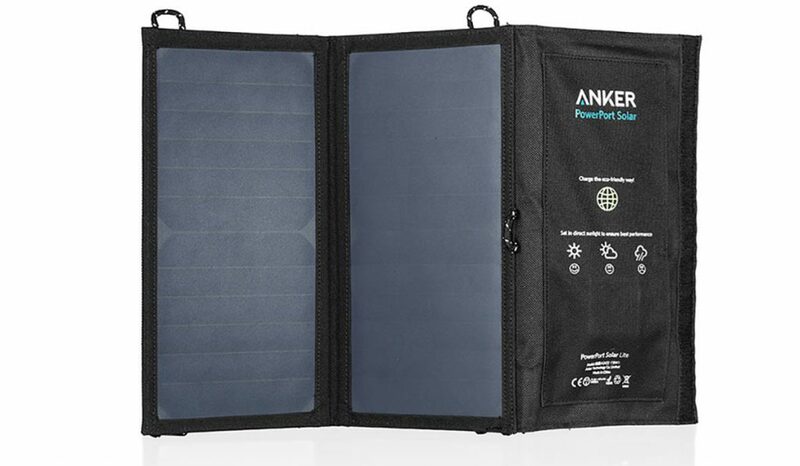 If you think solar panels can make your outdoor experience more enjoyable, here are some of the best solar panel chargers to help ensure your next outdoor adventure includes fully charged devices. If you are looking for mobile chargers that do not require solar energy check out are article on innovative camping gadgets article. It offers some great alternatives. The 15 watt PowerPoint from Anker is probably one of the best deals available in the market. 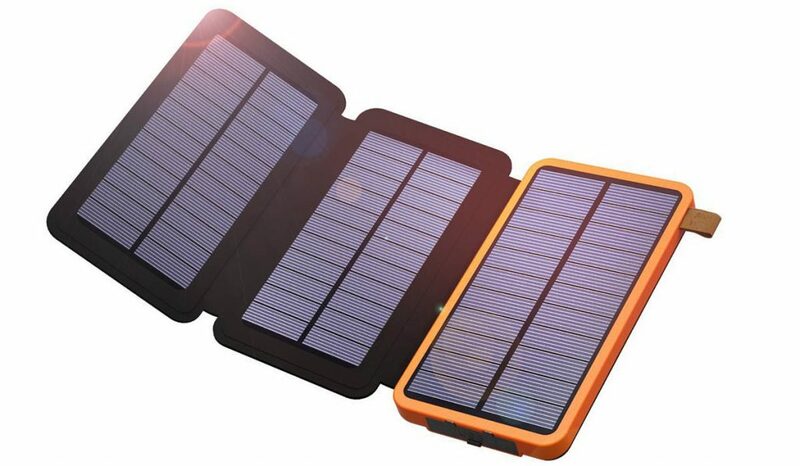 The PowerPort has powerful solar panels 2 USB outputs, 20,000 mAh power bank and intelligent power to match your device. It is priced reasonably at approximately $60 and is lightweight, shock, vibration and weather resistant. The versatility, portability and affordable price make the PowerPoint tough to beat. The 24 solar panels on this product increases the efficiency of charging by up to 21.5% – 23.5% for shorter charging times. It has 3 USB ports with iSmart Technology to automatically detect and deliver optimum charging for each device. Constructed with durable nylon, it is waterproof and hardy. 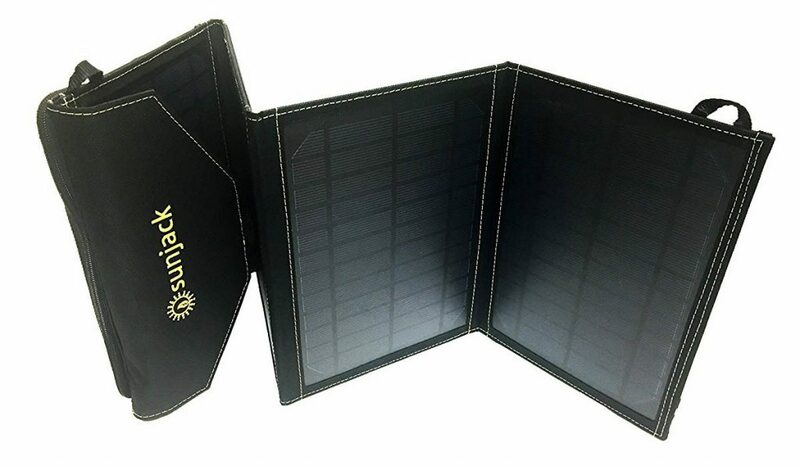 Unlike other solar panels, it is lightweight and folds down to a travel size. It does not come with a power bank though, so you will need to buy a 10,000mAh one for an additional $26 which makes this one of the most expensive chargers on this list. However if you need to charge multiple devices quickly the RavPower 24w is a great choice. This product is another great deal at around $65. It comes with a 10,000 mAh power bank, carabiner clips and weather resistant case. It weighs around 1.8 lbs (0.8 kg) and folds down to a small size. The battery has a fast charge capability and is full after around 5 hours of charging. From power to price standpoint the Sunjack is an excellent value. At around $40, this is an affordable buy and the tha fact that it is 24000mAh means it lasts a really long time. It features quick charging technology, 3 USB ports and it is as useful at the airport as it is at a campsite. It can also be used at home for standby power during emergency situations. It can be charged using your wall outlet or by using the solar panels. This is like a solar-panel-and-power-bank in one device. 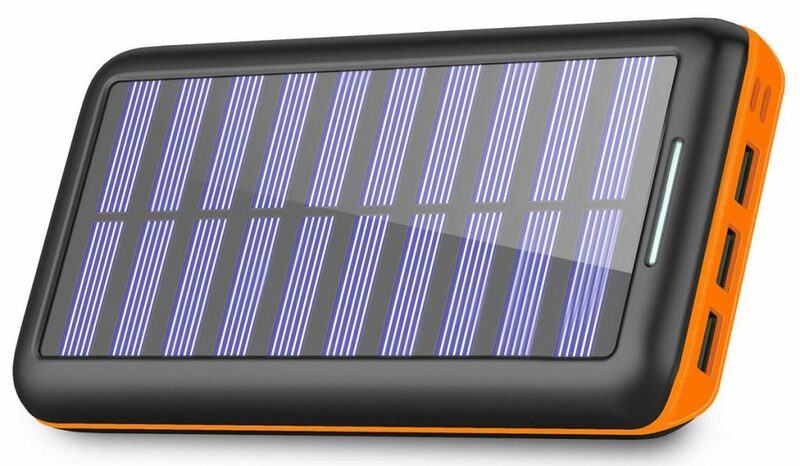 The X-Dragon is a IPX6 weather resistant, shock-resistant and dust proof solar phone charger for around $25. This is a foldable charger for easy transport during camping or backpacking. The product has dual USB ports, built-in super bright LED lights and a 10,000mAh power bank. It takes around 20 hours to reach full charge but you can also use a wall socket for charging. 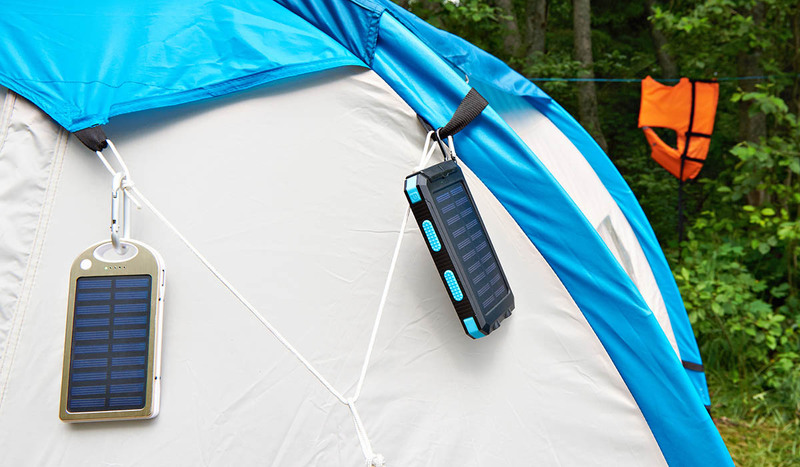 A portable charging device can easily extend your time outdoors. It can be used to charge not only cellphones but GPS devices, flashlights, portable fans and radios too. Charge the device by laying it out in the sun and then charge your gadgets during late afternoon. When it’s dark you can enjoy some electronic entertainment so that you don’t feel cut off from civilization while you’re outdoors.